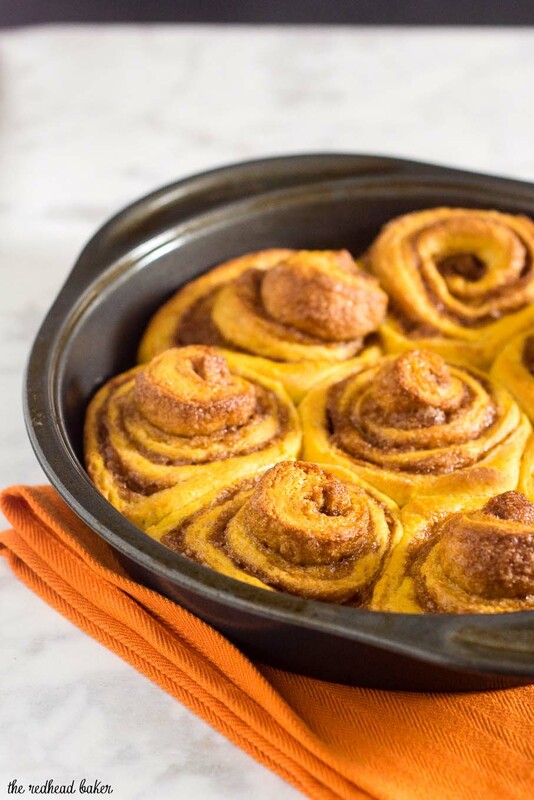 Pumpkin cinnamon rolls are a delicious way to start a fall morning! 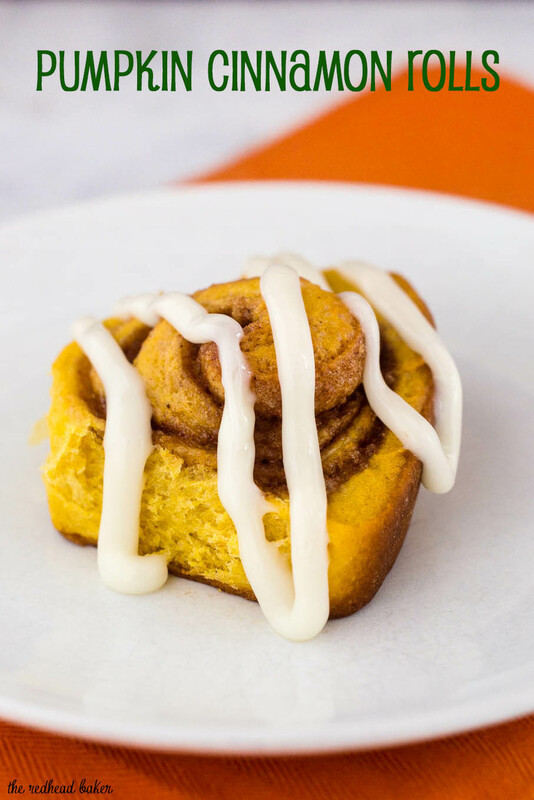 Sweet dough is flavored with pumpkin, rolled with a cinnamon filling, and topped with cream cheese drizzle. Welcome to Day 2 of #PumpkinWeek, hosted by Terri of Love and Confections! 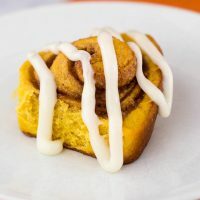 After you check out my pumpkin cinnamon rolls, don’t forget to scroll down to the bottom of the post for links to more pumpkin-filled recipes by other bloggers. I am a sucker for just about all sweet breakfast foods: pancakes, French toast, croissants, muffins, etc. But I can never pass up a cinnamon roll. For some reason, cinnamon rolls are a “special occasion” food for me. Possibly because growing up, we always had cinnamon rolls on Christmas morning while we opened our gifts. Even though I’ve learned how to make them, I still save them for special occasions. This pumpkin version would be delicious on Thanksgiving morning, or any fall occasion, special or not. Many people are intimidated to work with yeast at home, but it’s really not a big deal. I recommend that first-timers use a thermometer to ensure their warm liquid is neither too cold (which will fail to activate the yeast) or too hot (which will kill the yeast). As long as your liquid temperature is right, and you’re not using old yeast (which may have died), you should be good to go. Another part that gets people intimidated is kneading. If you have a stand mixer with dough hook attachments, it will do all the work for you. However, I find kneading by hand relaxing. How do you know when you’re done? Under-kneaded bread is lumpy. Properly kneaded bread is smooth. You can also try poking the dough: gather the dough into a ball and firmly poke it with one finger. If the dough bounces back to fill in the poke, you’re done. If it stays a deep dimple, keep kneading. A third test is called the “window pane test.” Tear off a small ball of dough, about the size of a golf ball. Stretch it into a thin sheet. If the sheet tears quickly, keep kneading. If the dough forms a paper-thin sheet you can almost see through (ie, a window pane), you’re done. After the dough rises, punch it down. Not literally, really. Poke it with your fingertips until it deflates. Then roll it out. The measurements given below are a rough guideline. Aim for those measurements, but you don’t need to be so precise that you need to break out the measuring tape. The more important thing is that you cut the rolled log into 18 roughly equal pieces, which ensures that you end up with evenly baked cinnamon rolls. If you cut some thin rolls and some fat rolls, you’ll end up with some rolls either undercooked or burnt. 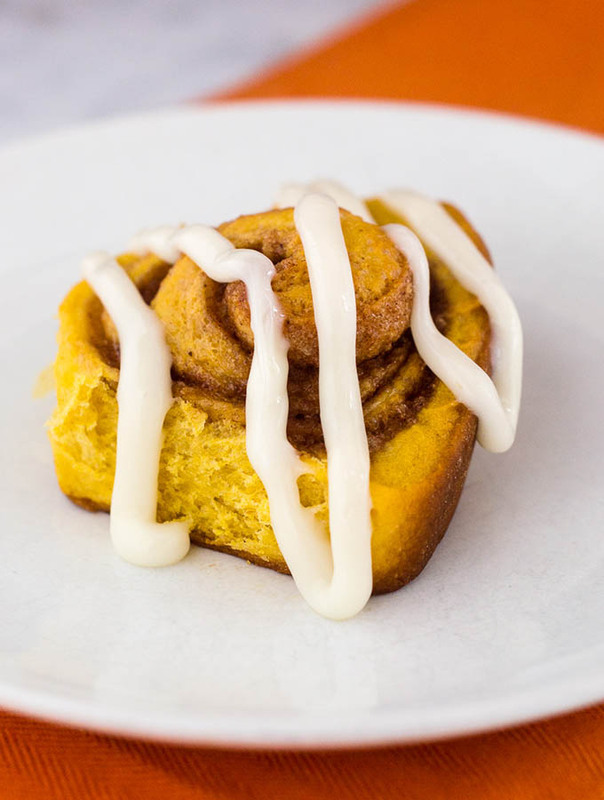 The recipe for icing on these pumpkin cinnamon rolls calls for maple extract, which I know most people don’t keep on-hand. If you want maple icing but don’t have the extract, you can substitute an equal amount of pure maple syrup (not pancake syrup) for the milk, and use vanilla extract instead of maple extract for a similar flavor. If you’d rather have plain cream cheese icing, use an equal amount of vanilla extract in place of the maple. 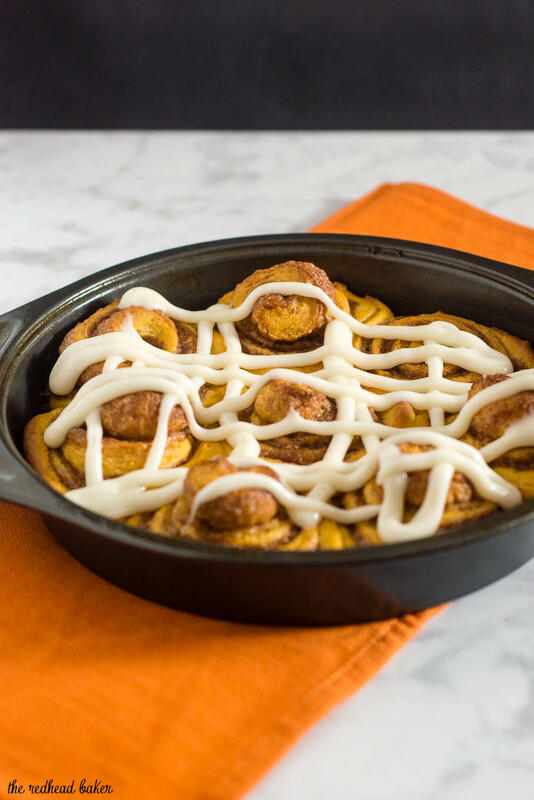 Pin this recipe for Pumpkin Cinnamon Rolls for later! Melt 4 tbsp of the butter in a heatproof glass in the microwave. Set aside to cool slightly. Sprinkle the yeast over the warm milk and set aside for 5 minutes. In the bowl of a stand mixer, stir together the flour, sugar, salt, cinnamon, nutmeg and ginger. Add the melted butter, milk/yeast mixture, pumpkin and egg and mix with the paddle attachment just until combined. Switch to the dough hook and knead on low speed for five minutes. 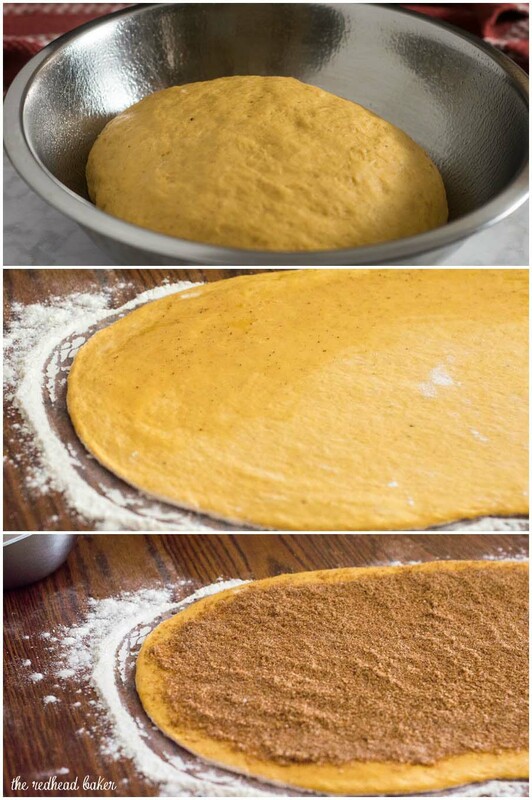 Transfer the dough to a large bowl oiled with nonstick cooking spray. Spray the top of the dough with nonstick spray, cover the bowl with plastic wrap, and place the bowl in a warm area for an hour, until the dough doubles in size. Make the filling: stir together the sugars, salt and cinnamon. Set aside. Press down on the risen dough to remove the air bubbles. Transfer the dough to a well-floured surface and dust the top with flour. Roll out to an 18-inch by 12 inch rectangle. Melt the remaining 2 tbsp of butter in the microwave. Brush the melted butter over the surface of the dough. Sprinkle the filling in an even layer over the melted butter. Starting with the long end further away from you, begin rolling the dough into a tight, even log. Once completely rolled up, crimp the ends with your fingers to seal the log. The log will have lengthened during rolling, so trim off the ends with a serrated knife to make the log 18 inches in length again. Using a serrated knife, cut the log into 1-inch sections. Oil two 9-inch round pans well with nonstick cooking spray. Place 8 rolls in each pan, 7 evenly around the perimeter and one in the center. There will be space between each roll. Cover each pan with plastic wrap and let the rolls rise for 45 minutes. After 15 minutes of rising time, begin preheating the oven to 350 degrees. Once fully risen, bake the rolls for 25 to 30 minutes, until the rolls are golden brown and baked through. Place the baking pans on wire racks to cool slightly. 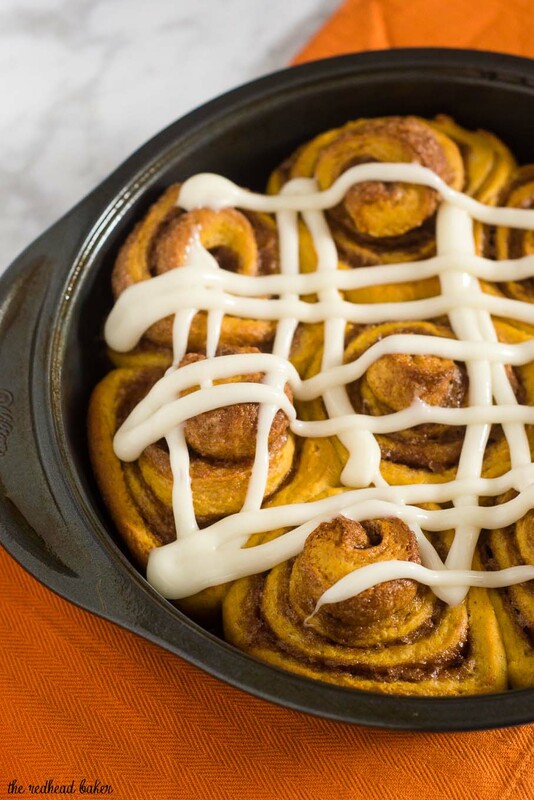 Make the glaze: whisk together the ingredients until smooth, then drizzle or use a butter knife to spread the icing over the pumpkin cinnamon rolls. Absolutely lovely. I am drooling over here. 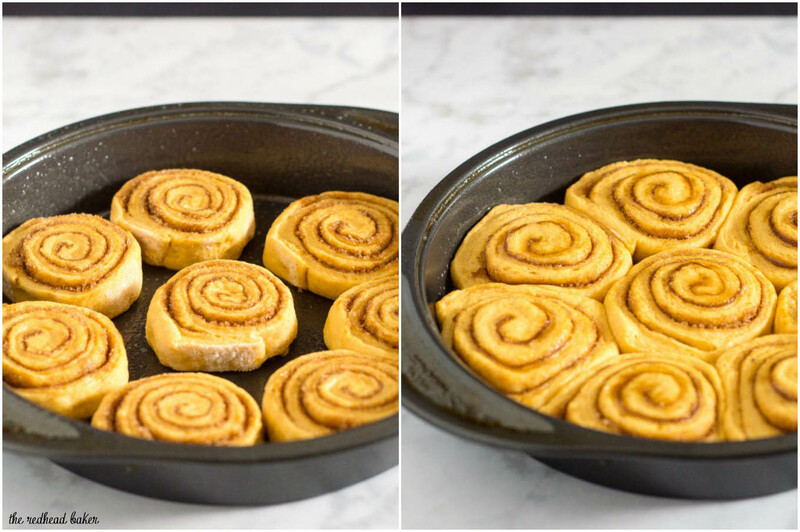 I love cinnamon rolls, add pumpkin for Halloween. The perfect breakfast for fall! I know a few people who will enjoy these treats.